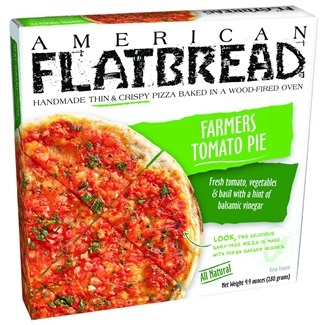 American Flatbread is the frozen pizza brand of Rustic Crust, premade pizza crusts. Most of their pizzas are topped with dairy cheese, but over the years, a couple American Flatbread Vegan Frozen Pizzas have emerged. We’ve got all of the details and have updated this post with our new rating system for you to leave your own review below! Both of their vegan frozen pizzas are completely meat-free (no alternatives), but are topped with flavorful sauces, garlic and fresh herbs. And you can choose between dairy-free “cheese” or cheeseless! This simple pie uses their organic wheat crust and is topped with house-made tomato sauce, dairy-free cheese alternative, garlic, and fresh herbs. 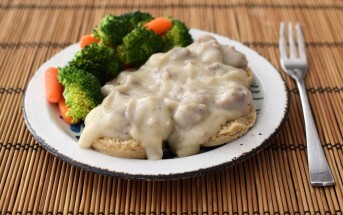 We believe the cheese alternative they use is Daiya. They skipped the cheese altogether with this bountiful flatbread. It has the same organic wheat crust, but is topped with plump tomatoes, onions, garlic, basil, red wine, and sweet balsamic vinegar. 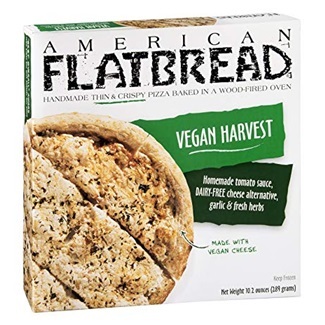 Availability: American Flatbread Vegan Frozen Pizzas are widely available in mainstream and natural food grocers throughout the U.S. Look for them in the freezer section next to their dairy-based frozen pizzas. 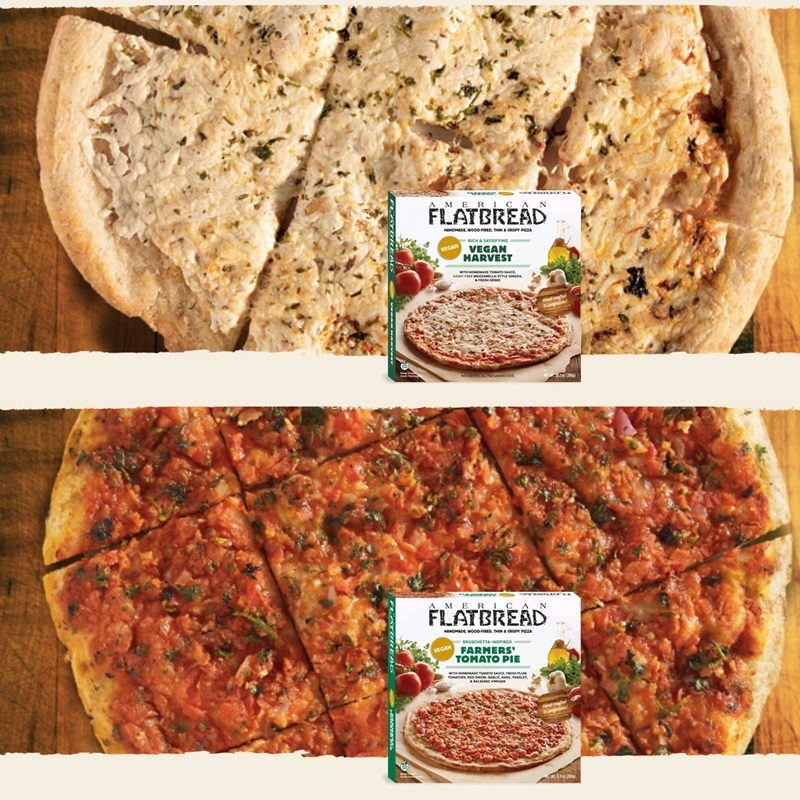 Certifications: We did not note any certifications on American Flatbread Vegan Frozen Pizzas. 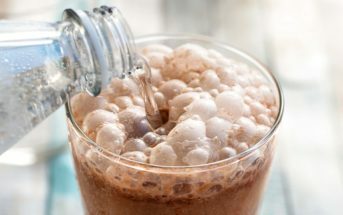 For More Product Information: Visit the American Flatbread website at americanflatbreadproducts.com. Would love to know the sodium per serving, if anyone can provide! These sound great! I’m also on a low-sodium diet, so if anyone can tell me before I go hunting, it would help tremendously! Thank you in advance if you can. The Farmers has about 450mg per half pizza and the Harvest is about 650mg per half pizza. My husband and I love these. Tasty and filling. 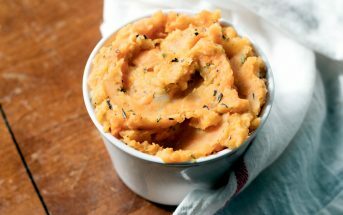 A delicious appetizer or dinner for vegans and non. This company offers a 10″ Vegan Harvest pizza in stores In New Hampshire. It is AWESOME, my picky non-vegan husband loved it and can not wait to buy more. Now hopefully we can find it where we live! Vegan harvest is delicious! My go to for my pizza fix! We love pizza(enjoy one every Tuesday). Tried Flatbread pizza and was pleased that we did. Tried to purchase again and store had none in stock. I’ve got to try harder to find a source since while I often bake my own “from scratch” I feel foolish doing so when Flatbread pizza does it better and so much easier on me. I had a coupon for this brand and it was on sale, so I decided to go ahead and try the vegan one, with vegan pizzas being hard to find. It was so delicious, I had to go back to the store and stock up. However, the only store near me (Sprouts) that carried it has stopped doing so. I have checked 2 Sprouts stores and 2 Whole Foods near me – no American Flatbread pizza in sight. They have been replaced by another brand that doesn’t offer a vegan option. What a bummer! Hopefully they get their distribution back up. I was surprised to see that American Flatbread now makes a vegan pizza! Since I live in VT, I’m very familiar with their products (they are located not too far from where I live), so I’m excited to hear about this one! I have tried the flatbread pizza and it isnt too bad although a tad shy on toppings in my opinion. It was good tasting in general I just expected more. These are very tasty. They are very fresh. By way of full disclosure, I work for the company. We did change cheese vendors for a short period and the consumer reaction was not great. We heard them and have returned to the original recipe. That explains it! Thank you for the update on this Kathleen. My favorite non-dairy pizza. I just add my own favorite toppings (turkey pepperonin, onion, green pepper, mushroom) as I just need a no-mammal pizza. I’m disappointed with the new non-dairy cheese formula. I easy about one of these pizza a week and until recently they were great. I don’t think they are using daiya anymore and the new cheese is almost unpalatable. I won’t be buying these pizzas again unless I hear that the cheese has been improved. Hmm, interesting. According to their website, they are still using Daiya, but we’ll have to keep an eye out. Perhaps Daiya changed their formula? I have found this to be the best non Dairy frozen pizza I have tried. I do have to be careful with food made in non dairy free companies but I love pizza and we do not have many choices in our area so I gave it a try and have had no problems. I want to say thanks to you Alisa for all you do and all the info you make available, it has been a tremendous help to me. Thank you for sharing your thoughts on this brand Laureen, and for the kind words. I’m so happy that I can help!